"THE KNOT BEST OF WEDDINGS 2017 PICK"
Brides Voted. WE WON! SIX YEARS IN A ROW! Best of Weddings 2012, 2013, 2014, 2015, 2016 and 2017 Pick! To our loyal customers - We thank you for your support and business. silk screened or letterpress invitations. Our on-line invitations are easy to view and order. With most of our albums, you can see an invitation proof right on line. Wedding Programs can be ordered right on line as well. Cordially Yours has over 130 albums in our studio. You can view over 30 albums on line. Paid rush service available from some brands. 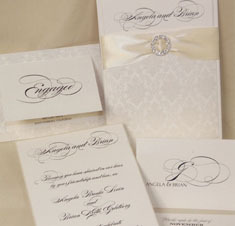 Our elegant calligraphy is done by a very unique automated pen machine, imitating hand calligraphy but with perfect lines, curves and swashes all at a very reasonable price. We have over 250 calligraphy fonts that you can select. We love to match ink colors! and wedding programs as well. Need a printed menu, no problem. Placecards...a snap. If you need stationery, bookmarks or favors, visit our Carlson Craft album pages. Any questions? Send us an e mail or call. 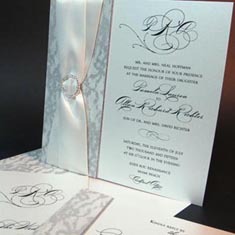 Authorized dealer for many upscale invitation companies. BUY ON LINE, OR call to schedule an appointment at our Newton, Massachusetts studio. We suggest you browse all the albums featured here before visiting us for an appointment. We are located just off route 9 about 2 miles from the Chestnut Hill Mall. Invitations can be ordered in person, by e-mail or clicking the above "INVITATIONS - BUY ON LINE" link.